It's that time of the year again where Pumpkin fever is in the air. 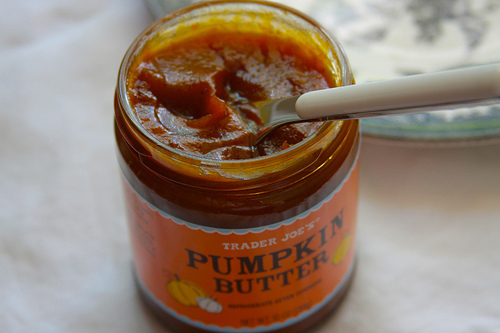 One of my all time favorite pumpkin items is Trader Joe's Pumpkin Butter. It mixes well with just about anything but it also does a fine job riding solo on your spoon for a quick fix. Mix it with some greek yogurt and you have a delicious protein packed snack or add it to your cookies for a bit of pumpkin spice. Definitely pick up a few extra jars as this item is seasonal. Get nutrition facts for Trader Joe's Pumpkin Butter. Trader Joe's not a drive away? Pick it up online!